It's 21:30 at mount Moléson, Switzerland right now. 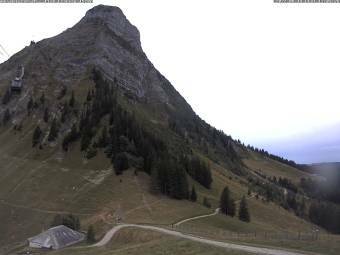 Gruyères: Several Webcams, 2.5 miles away. Gruyères: roundshot 360° Panorama Gruyère Tourisme, 2.5 miles away. Les Paccots: roundshot 360° Panorama Corbetta, 5 miles away. Riaz: Weathercam Riaz, 5.8 miles away. Châtel-Saint-Denis: roundshot 360° Panorama Rathvel, 6.9 miles away. Château-d'Oex: roundshot 360° Panorama, 7.4 miles away. Château-d'Oex: 360° Panorama La Braye, 7.4 miles away. Rougemont: Videmanette, 9.5 miles away.